Day one of the World Junior Championship is in the books from Montreal and Toronto and it was an impressive start from a Minnesota Wild perspective. With four draft choices participating, each player contributed at least a point to open one of the best tournaments that hockey has to offer. Eriksson Ek contributed a goal and an assist while going plus-3 in 14:12 of ice time. It was a solid afternoon in a lopsided 6-1 victory for Sweden over Denmark. Sweden anointed Eriksson Ek captain entering his second World Junior tournament and he knows what’s expected out of this year’s team. The 20th overall pick in 2015 is the only player on Team Sweden with NHL experience after his nine-game stint with the Wild to open the season. Playing on a line with wunderkind Buffalo Sabres prospect Alexander Nylander, the younger brother of Toronto Maple Leafs phenom William Nylander, Eriksson Ek quietly contributed a goal on a rebound, as well as an assist. It will be difficult to truly gauge how Eriksson Ek compares to the top talent in the tournament until Sweden plays a more formidable opponent. Opening the tournament against Denmark was essentially a warmup game for a squad that is expected to challenge Canada for the gold. Nevertheless, the captain and company took care of business in a big way to open the tournament. Minnesota’s first-round pick in the 2016 draft had an assist on fellow Wild prospect Jordan Greenway’s goal while skating to a plus-1. He also had two shots and led all forwards in time on ice with 20:11 as the United States downed Latvia, 6-1. Kunin was involved early and often showing an all-around game that boasts many impressive aspects. He burned a Latvian defenseman early to draw a penalty, ripped a rebound shot off the post late in the first period, and blocked a one-timer shot while killing a penalty in the second. 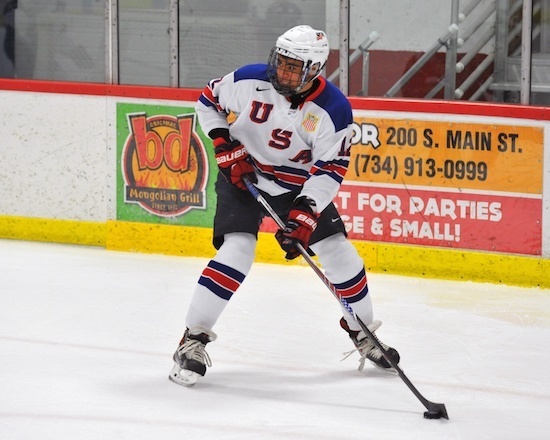 Similar to Eriksson Ek, Kunin is a jack-of-all-trades for the United States. While he didn’t stuff the stat sheet like he’s used to at the University of Wisconsin, he made an impact in a plethora of ways. The United States will look for Kunin to factor in beyond just scoring as he was a member of both the penalty kill and the power play. Dec. 28, United States vs Slovakia at 6:30 pm CST. Greenway scored a late goal while leading the team with seven shots on net. He also went plus-2 in 14:34 of ice time. Hits were not tracked in the official stats, but he had at least five solid body checks. First and foremost, Greenway is absolutely massive for a 19-year-old. At 6 feet 5 inches and 230 pounds, he plays in a way that utilizes every ounce of it. The 2015 second round choice plays the much-needed role of power forward on a team jam-packed with speedsters. To no one’s surprise, he’s physically overpowering in front of the net and in the corners with his NHL-ready physique. Except for his physicality, I didn’t think his play exceeded some of his teammates, but he was named the player of the game for the United States in a bit of a surprise. His only addition to the scoresheet was a rebound goal in the waning moments of the contest. In a tournament full of kids that are still growing into their bodies, the United States has elected to use his imposing size to control possession behind the net as well as planting him in front of the net on the power play. Greenway may need to settle for less of a scoring role than he is used to, but he’ll be integral to his team’s success if he can fulfill what’s asked of him. Kaprizov compiled goal and an assist while going plus-1 in 17:21 of ice time in a 5-3 loss to host Canada. Considering Kaprizov plays on the other side of the world in the KHL, this is the prospect that Wild fans are only recently becoming familiar with. He’s slowly making a name for himself as he’s been scoring at a pace on par with Evgeny Kuznetsov and Vladimir Tarasenko at the same age. World Juniors will be his first real opportunity to display his talents on a North American stage. Kaprizov, Russia’s captain, drew an early test having to play host Canada in front of a raucous Air Canada Centre crowd. It was a good showing for him personally proved he can be the go-to guy for Team Russia. His wrister in the third period burned the Canadian goaltender, but it was too little too late by that point. Overall, Kaprizov had a solid outing against one of the favorites to win gold. His play should stand out even more as the tournament progresses and he faces easier competition. Dec. 27, Russia vs. Latvia at 3:00 pm CST.